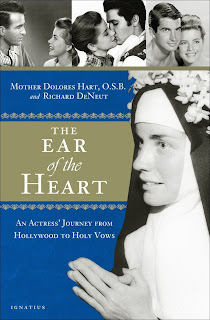 When I originally requested The Ear of the Heart: An Actresses' Journey From Hollywood to Holy Vows, by Mother Dolores Hart, from the library, it was because, you know, it featured a NUN. A memoir about a NUN. How could I not read that? When Mike picked it up for me I got a real eyeful. At nearly 430 pages, this is not for lazy readers, no sir. This is a serious autobiography, and it chronicles Mother Hart's life from childhood to the present day. It includes a plethora of beautiful photographs and extensive notes. I knew that if I was going to make the 21 day loan period (with lots of interruptions to change diapers and scrape trantruming toddlers off the floor) I had to dive right in. So I did. Ok, I'll start with what I *didn't* like and then move to the positives. What I did not like is the way that the book is structured. It is co-written by Mother Hart and her friend Richard DeNeut. The majority of it is in Mother Hart's voice, which is indicated in italics. Richard's contribution is in regular typeface, and all of this is interjected with some direct quotations from Mother's journals which are indented and indicated with a dash throughout her writing. Needless to say, I found this all quite choppy. I like a single, clear voice throughout a book. If a pair writes a book, I think it is better to have each write separate chapters. I do not like a constant going back and forth between voices. I'm still going on about this, so you can tell that it really bugged me. :) It's not my preference, but I stuck with it, and I'm glad that I did. So, what did I like? I very much enjoyed the story in this book. Mother Hart has led a very interesting life and it's engaging reading. I was most interested in her life as a nun, but all the same, the early part of the book about her family life (somewhat dysfunctional) and her film career (she kissed Elvis!) was fascinating. She was not raised a Catholic, and made the decision in late elementary school to convert, since she went to a Catholic school and wanted to receive the Eucharist along with her classmates. Throughout, I could see God's hand leading her, protecting her, calling her, to her contemplative vocation. It's quite beautiful. She depicts her exit from Hollywood and entrance into a cloistered Benedictine community with great detail. I was *dying* for information on life in the cloister, and she does not disappoint. We follow her throughout her postulancy and novitiate, and then on to temporary and final profession. When she talked about how unprepared she was for monastic life, and cried every night for 3 years after she entered, my heart broke for her. Her expression of emotion is very easy to relate to. She does not talk a lot about her decision to take final vows, it just seems that her perseverance led to a blossoming in religious life and it was natural to continue. I would have liked it if she would have fleshed that out more, but I could see the point she was trying to get across. In the later years of her life, she discusses some changes in her community (they kept to their traditions following Vatican II, including a rite of Consecration of a Virgin that is very important to them, as well as a legal kerfluffle over an expansion into a sister monastery) and in her health as she begins to experience chronic pain in her legs and is ultimately diagnosed with neuropathy. It's all quite fascinating. This isn't a quick read, but if you are at all interested in the religious life, I highly recommend it. And so, announcing the next book for Catholic Book Club, which I'm reading right now: Beyond the Walls: Monastic Wisdom for Everyday Life, by Paul Wilkes. Yes, say it with me, it's PERFECT. I'll report in on it in the next couple of weeks. 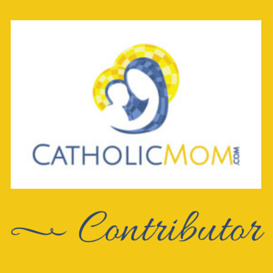 Meanwhile, we still do have a Catholic Nook post coming from my sister, Shauna'h. That will be either tomorrow or early next week, depending on how life goes (she does have twin infants :)). Our topic? Catechesis and ongoing formation, interspersed with a reversion story, so exciting! Thanks for the review! It sounds like a good book for my daughter. She is a determined reader and the exposure I think will be good for her. Looking forward to the Nook post.